Daniela Nikolova was born in September 1976, in Sofia – the capital city of Bulgaria. From a very early age art was an inseparable part of her life, her biggest passion however was painting. Daniela grew up away from nature, in the heart of the city. She did not grow up near horses, but the beauty of these animals made her fall in love with them since childhood. For the last 15 years she has been living in a small town in Greece and has the pleasure of getting to know more about horses and being near to them. The small city gives her the opportunity to have her own treasure - ORION XLVII- Caballos Mayoral, a purebred Spanish Horse. The 4 year old Andalusian was born in Zaragoza, Spain in the stable of Jose Maria Caballos Mayoral. 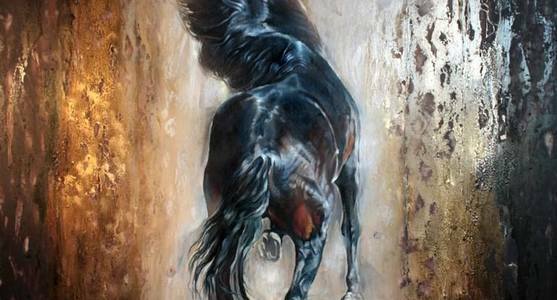 Daniela is strongly connected with the horses of Jose – they are the only source of inspiration for her paintings. 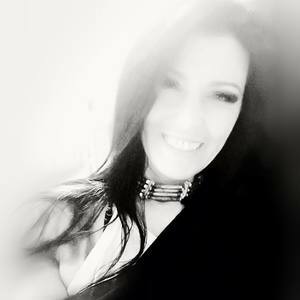 “Some part magic and myth, some part mystic and spiritual, those l are the ingredients that make me feel as if I am a part of the Caballos Mayoral spirit” she says. In the past years she has been preparing a collection of paintings themed “ENTENDIDO & INDIO” – Caballos Mayoral. Having immeasurable love towards kids, she organizes exhibitions and free art activities for Christmas (Santa Claus`s house, Sugar house, Frozen house – all created and painted by Daniela), Carnivals (Styrofoam crafts and face painting), Easter, Summer fests - one of those fests is “Let`s paint the biggest Easter egg in Greece”. This year`s event was featured in more than 70 media, including TV, CNN Greece, online magazines and radios and was recognized as the biggest of its kind in Greece. The charity activities, donations and contributions to the city she lives in – Ptolemaida are an irreplaceable part of her day to day life. Daniela is giving a lot of smiles and happiness to the kids, painting completely free of charge on the premises of the local Primary, Secondary Schools, as well as the Schools for the children with special needs. For already 5 years with her help in one of the schools there is a summer eco-festival being organized, in which the kids are painting and decorating the school environment, Daniela teaches them how to re-cycle and make trash-art. Daniela is enjoying success both as an arts teacher and artist.